The whole point of meetings – unless it’s a public announcement by the big boss – is collaboration. Strangely, we seem to be lacking software tools to support this kind of synchronous collaboration. Our primary meeting tools are PowerPoint or Keynote presentations, whiteboard drawings, and the occasional shared Google Docs document. It’s hard to switch presenters. We have to unplug the projecter or change seats, and jump between different PowerPoint files. This is far too static. I don’t know about your meetings, but in our office, we’re going back and forth in meetings, with multiple people wanting to contribute and show something to back up what they’re saying. PowerPoint presentation mode is read-only. For the presenter, it’s pretty awkward to jump into editing mode to add notes, correct a mistake, move or add an agenda item during the meeting. And for the audience, it’s impossible. People watching the presentation become an “audience” instead of participants. They cannot even follow the presentation on their computer and click a link in it. The agenda, the meeting structure, isn’t well-represented by PowerPoint slides. It’s hard to keep track of which agenda item we’re currently in, and whether we’re running out of time. I’ve been thinking about meeting collaboration tools for a few years, and I need to publish my thoughts so I can get them out of my head (or start doing something about it). 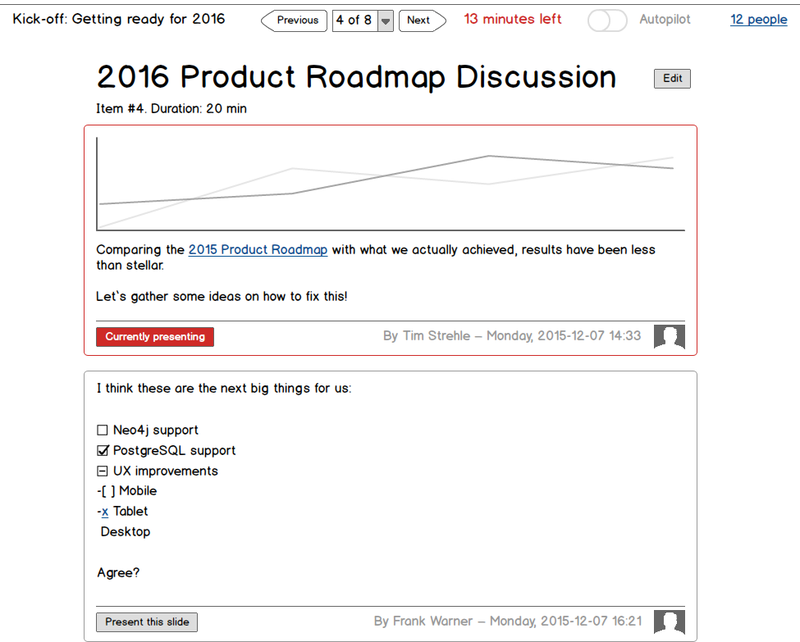 So let’s say we’re building a new, Web based tool called “Live Meeting Agenda”. Someone uses it to create an initial agenda, then send its URL to each participant, so people can collaborate on the agenda. 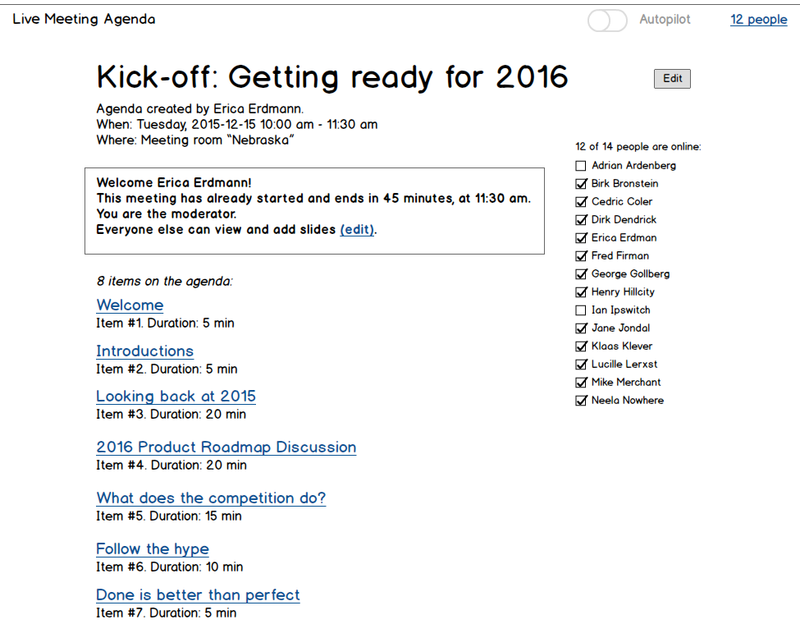 Before or during the meeting, anyone can add items, slides, notes, links, files. The magic is in the “autopilot”: Any participant can turn it on to switch her browser into “projector mode”. In this mode, the browser will automatically be notified when a “Present this slide” button has been clicked, and it will display the slide. Hook up a computer with a full-screen browser on “autopilot” to a projector, and you’re remote-controlling the big screen. Remote meeting participants might also want to use autopilot to always see the current screen. Depending on permissions, any participant can take over by clicking one of the “Present this slide” buttons. Maybe on a fresh slide which he just added during the meeting. Maybe what I’m dreaming of has already been built? Please let me know! 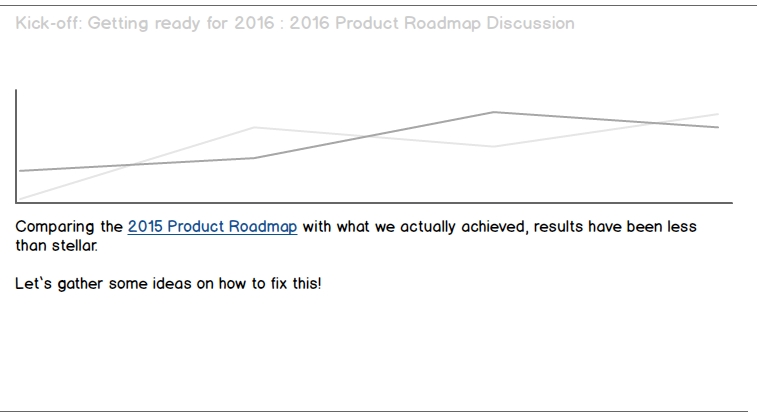 And I’d also love feedback on the fictional product I’ve outlined. Would you use it, would you pay for it? Update (2016-01-13): Minute doesn’t have any presentation features, but the meeting agenda part is somewhat similar to what I’ve sketched.